AMC's mega-hit The Walking Dead took over The Hulu Theater at Madison Square Garden during New York Comic Con on Saturday, Oct. 6. The panel was primarily a love letter to Andrew Lincoln (the series' steadfast leader Rick Grimes), who will be leaving at some point during Season 9 and a brief preview of what's to come. Kirkman, the man behind The Walking Dead comic books, teased a bit about the Whisperers, an upcoming band of villains who wear walker flesh to go incognito and stir up some chaos. Find out in a special sneak peek at the highly-anticipated first Season 9 episode. "The visuals of the Whisperers is absolutely breathtaking." Or, terrifying? We're thinking terrifying. Meanwhile, Norman Reedus (Daryl) teased the series' changed look, courtesy of new showrunner Angela Kang. "It reminds me of what I fell in love with in the beginning," Reedus said. "It’s like a Western." Well, there are a lot of horses now! The panel was moderated by Talking Dead host Chris Hardwick and featured stars Lincoln, Danai Gurira (Michonne), Reedus, Melissa McBride (Carol), Jeffrey Dean Morgan (Negan), Kang, and executive producers Scott M. Gimple, Kirkman, Gale Anne Hurd, Dave Halpert and Greg Nicotero. 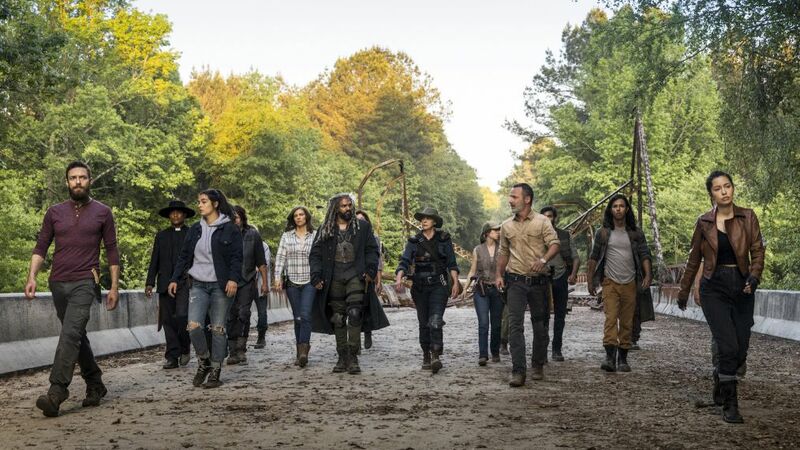 The biggest news to come out of the night was Kang's confirmation of three returning faces to TWD including Jon Bernthal's Shane (which most fans already knew about), Sonequa Martin-Green's Sasha and Scott Wilson as beloved Greene patriarch Hershel. Unfortunately, after the panel wrapped, news broke that Wilson had passed away at 76 on Friday due to Leukemia complications. During the panel, however, the cast was mourning the loss of No. 1 on the call sheet, Lincoln, who was described as "a maniac" on set by Gurira—in the best way possible, of course. Lincoln was in good spirits—his wife was in the audience and the crowd went wild at any mention of him—as he spoke of his final takes on set. "My last day was amazing, but on the way to it being a farewell, I pulled down the set onto the A-cameraman, Deek... and knocked him out," he explained before shifting the blame. "I think it was actually Norman’s fault." Lincoln also explained a scene in which Rick had to "chortle," an out-of-character sound for the former cop to do. To achieve the moment, Reedus and Nicotero took to tickling the Brit's toes to make him laugh. "I like to think of myself as a serious method actor, and I finished like a fool," Lincoln laughed. It was clear though, that the actor who put in nine seasons of hard work will be missed, as the group went down the line recalling favorite behind-the-scenes moments. And of course, they had all prepared for this sad day. As Gimple (now chief content officer) explained, "There was a plan. There were little turns here and there, but it generally stayed to the plan." We can't wait to see what they've got in mind for this iconic zombie-slayer and the rest of his badass group of survivors.